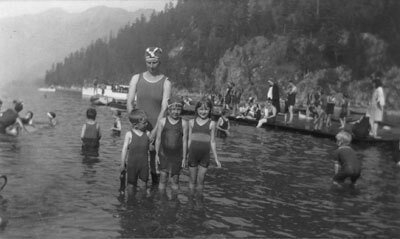 Image of Mrs. Lunn and 3 children standing in the water at Horseshoe Bay. Other swimmers appear in the water and on the dock in the background. Scanned December 2011 using Epson Perfection V700 Photo at 300dpi and 100% of original image size. Alternate Versions: Lossless TIF from original scan at 300dpi and 100% of original print. W14.5 x H9 cm black and white print on photo paper.